Graduate programs at the College of Veterinary Medicine are based on the One Health principle that advancing animal and human health stems from the same scientific foundation. We provide state-of-the-art PhD and MS training at the intersections of animal, human, and ecosystem health. 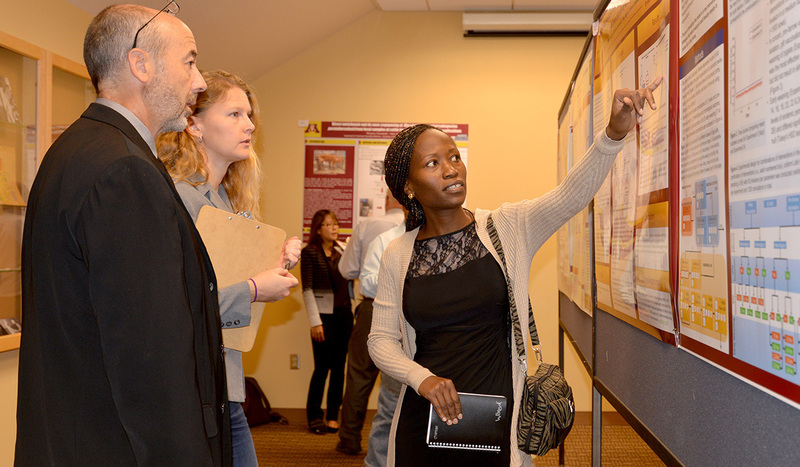 Students in the Comparative and Molecular Biology (CMB) program seeks to understand the mechanisms of animal and human health. Training is intradisciplinary and provides students with individualized mentorship in cutting edge technologies. Research in the Veterinary Medicine (VMED) program focuses on the scientific study of the transmission and progression of diseases of importance to domestic animals, wildlife, and humans with applications to diagnosis, prevention, and treatment. Our mission is to provide education through research that advances animal and human health. We are committed to helping students graduate in a timely fashion through individualized mentoring, clear programmatic timelines, and annual reviews. PhD trainees typically complete their programs in less than 5 years. You will work closely with faculty and peers in a supportive and collaborative environment to develop the critical thinking, technical, and communication skills for successful careers in academia, private industries, or the public sector. Our graduates will have not only strong technical skills but also have the professional and transferable skills that employers seek. Whether your career objective is to apply your scientific training in academia, the private sector, or in nonprofit/governmental institutions, we provide the courses, support, and learning experiences to build critical thinking, communication, and team-working skills that will accelerate your career trajectory. The College of Veterinary Medicine and the University of Minnesota emphasize a welcoming and inclusive environment in which multiple voices and experiences contribute to excellence in teaching, learning, and scientific discovery. The College of Veterinary Medicine (CVM) Graduate Student Seminars are held in 215 Veterinary Science Building on Thursdays at 12:00 noon.